Peter Sousa of Warwick caught seven striped bass including this 31” keeper on No Fluke Charters out of East Greenwich Cove. The fish was caught near Conimicut Light in fifteen feet of water. Today I registered and recorded my fist two tautog fishing trips in the Rhode Island Recreational Online Angler Logbook. It took ten minutes. Anglers can use it free of charge and the system is voluntary. Some saltwater anglers hold details of their fishing trips close to the vest. The less others know about when, how and where they fish the better, particularly an environmental regulatory agency like DEM. However, information in this logbook is confidential; data will be examined in aggregate form to provide an independent data source for DEM policy makers. I like the log system and will give it a try this season. It allows me to keep accurate historical data that I can build on year after year while helping the fishery. Dan Costa, who developed the logbook for DEM’s Fish and Wildlife Marine Fisheries Department, said, “We hope Rhode Island anglers use the logbook to their advantage, to help them fish, while we collect data to improve the fishery.” Dan said that Massachusetts one year old logbook system has about 200 uses. Rhode Island, who announced their logbook program three weeks ago, has 45 anglers signed up at press time. Visit http://www.dem.ri.gov/ to sign up for the logbook and/or e-mail questions to Dan Costa at dan.costa@dem.ri.gov . 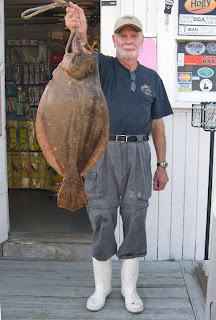 Anglers use squid as bait for fluke (summer flounder), sea bass and many other species. Last week I attended a Rhode Island Saltwater Anglers Association seminar titled Squid Fishing Strategies, Locations & Tips given by one of Rhode Island’s top anglers and squid authorities Dave Fewster. Squid fishing is part science, part art and very stealthy according to Dave. “You have to put in the time to find out where they will likely be, set up your lights and then be ready to move into action when they arrive”. Dave related that his favorite locations for catching squid are Newport, Jamestown and Narragansett. Usually near bridges, jetties, wharfs and always around light that attracts the squid. Dave related that the season usually starts at the end of April and runs through May. However, last year the season extended well into June. Calm water is ideal for squid fishing as is a full noon and water temperatures around 59 degrees. Dave spoke highly of new Yozuri squid rig that people (and the squid) cannot seem to resist. He found it at Ocean State Bait and Tackle in Providence. The RI Lions Sight Foundation (RILSF) will hold their 3rd Annual VIP Fishing Tournament for Visually Impaired Persons (VIP) on June 27, 2010. The half day tournament will be held on a chartered party boat out of Galilee, RI. Participants are eligible for trophies and an opportunity to represent Rhode Island at the Lions National “VIP” Tournament which takes place on the Outer Banks of North Carolina in October. For information contact Ken Barthelemy, tournament chair, at kenbar123@aol.com . Robb Roach and his Brand X Production Company, has produced a series of adventure sport videos airing five times a week on Cox 3. Programs also air on Video’s on Demand (VOD’s) were Kettlebottom Outfitters has a number of other programs on fishing and hunting. Shows are on a variety of topics from shark fishing to kite surfing. I still use Robb’s recipe for baked fluke… a recipe I like and learned from watching one of his videos. Visit http://www.kettlebottom.com/ for details on Brand X programs. The Department of Environmental Management (DEM) announced that Saturday, May 8 and Sunday, May 9 are free fishing days in Rhode Island. Rhode Islanders and visitors can fish in freshwaters without a fishing license or trout conservation stamp. Free loaner fishing rods and bait are available. Visit http://www.dem.ri.gov/ for locations and details. Tautog. Ken Ferrara of Ray’s Bait and Tackle, Warwick, related that Ken Landry caught a nice white chinned tautog at Ohio Ledge. He also caught a 36” striped bass off Pine Hill this past weekend. 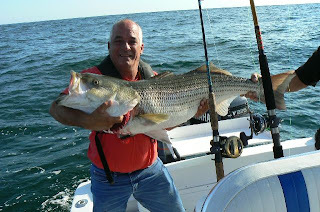 Robb Roach of Kettlebottom Outfitters in Jamestown reports a 10 lb fish caught off Narragansett. 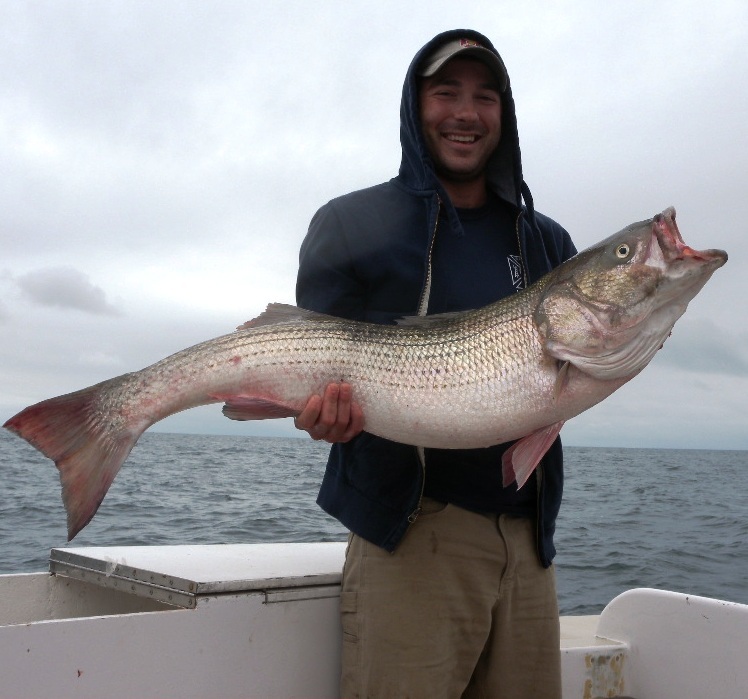 Striped bass were all over Narragansett Bay and this week. Robb Roach from Kettlebottom Outfitters reports decent fish caught to 27” in the Narrow River. Angler Peter Sousa of Warwick landed seven striped bass and two keepers to 31” on No Fluke Charter Fishing this weekend. Pete caught his fish trolling with tube and worm on lead line weighted with three ounce sinkers, a method that got the line down low with only 60 feet of line out in about 15 feet of water. The fish were caught between Gaspee and Conimicut Point. Steve McKenna of Cranston and an associate at Quaker Lane Outfitters, North Kingstown, reports many keeper bass to 20 pounds being taken in mid Narragansett Bay area. Steve caught eight keepers using metal lip surface swimmers. His fishing friends used Danny plugs and spook type lures and did just as well. School striped bass with keepers mixed in have been landed in East Greenwich Cove; off Poppasquash Point, Bristol; areas north of Connecticut light, Warwick and Barrington; Pine Hill off Prudence Island: and a host of other Bay and river areas. Freshwater fishing for trout at stocked DEM ponds is still good, visit http://www.dem.ri.gov/ for listings. Andrew Cahrhoff of Erickson’s Bait and Tackle in Warwick said that fishing has been good and promises to get better now that spawning season is upon us. Andrew will be fishing the shallows as the water warms and fish start to clear their beds for matting. Andrew bass fishes competitively; his favorite places to fish include Beach Pond, Johnson Pond and Indian Lake. Members throughout the State from the Rhode Island Party & Charter Boat Association donated canned goods and cash at their annual dinner which they donated to the Johnnycake Center’s emergency food pantry in South Kingstown, RI. The spring run of striped bass is underway. We have received reports of small school striped bass being caught off Rhode Island coastal shores from Westerly to Newport. School striped bass have been caught at Narrow River in Narragansett, on the Pawcatuck River in Westerly and on Narragansett Bay. A number of fish have been landed in Greenwich Bay off Chepiwanoxet Point and Old Buttonwoods in Warwick. With the striped bass season underway here are some of my favorite hot spots and methods used to land spring striped bass. 1. Greenwich Cove, East Greenwich, RI (Apponaug Cove in Warwick is good too). This is the first place I ever caught a striped bass. Menhaden seem to find their way to the cove early. And, it is surrounded with vegetation with plenty of insects to start a feeding chain reaction that ultimately leads to striped bass. This is because the bass feed on small bait fish that are feeding around the perimeter of the Cove. I have caught bass at the end, middle and mouth of the Cove near Chepiwanoxet Point in Warwick depending on the location of bait fish in the Cove. My favorite baits are hard plastic lures (both surface and swimming) as well as soft plastics early in the season and once they arrive, menhaden chucked or live. 2. The East Passage of Narragansett Bay between Popasquash Point, Bristol and Bear Point Prudence Island. I have caught many large fish in this area, particularly trolling with tube and worm. Many anglers fish this area with menhaden (live or chunked). I have particularly good luck fishing the pad or bank areas of the shipping channel. 3. The West Wall of the Harbor of Refuge in Jerusalem area, South Kingstown. This area provides shore anglers (and boat anglers) with one of the best first Rhode Island striped bass opportunities as the bass make their run past the Connecticut coastline to Rhode Island. Angler Steve McKenna reported great fishing off the wall for the past couple of weeks. He and fellow anglers landed hundreds of bass using primarily soft plastic lures over the past two weeks. 4. Buttonwoods section of Greenwich Bay, Warwick, RI. 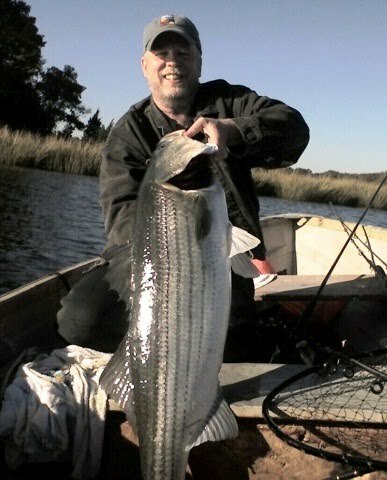 The area from Oakland Beach to Apponaug Cove in Warwick has been a good for early spring striped bass area. Many fish have been caught with soft plastic lures, surface poppers as well as swimming lures. Most fish have been caught up against the shore. As the spring progresses, trolling with lures or tube and worm is productive. Trolling is most productive close to shore or at the water depth breaks one to two hundred yards off shore. a. The Hurricane Barrier down to Save the Bay on Fields Point in Providence. Anglers have caught thousands of bass in this area. When the menhaden spawning runs are strong striped bass chase them up the Providence River to the Seekonk River and other Providence River tributaries. Bass over 50” have been caught in this area. b. The area all around and in front of Save the Bay at Fields Point, Providence is good too. Shore anglers have access to this land courtesy of Save the Bay. c. The shoreline in Warwick, Cranston, Barrington and East Providence north of Conimicut Point has been hot as well. 6. Hog Island, Bristol, RI. Fishing the depth break two hundred yards off Hog Island on the west side has been good for early spring bass. I have trolled this depth break in spring and seldom get skunked. Two areas of high ground or mounds appear on the west side of the Island. Fishing over these areas or trolling over them produces fish too. The Rhode Island Party & Charter Boat Association (RIPCBA) held its annual dinner at Spain Restaurant in Narragansett. Members donated canned goods and cash at the annual dinner which were donated to the Johnnycake Center’s emergency food pantry in South Kingstown. Over 100 people attended the dinner where Captain John Rainone, past president, was recognized for his service to the organization. Captain Rick Bellavance, RIPCBA president, presented Rainone with an engraved watch. The Department of Environmental Management’s (DEM) Division of Fish and Wildlife stocked trout in several locations not stocked for opening day due to the impact from March floods. Fishing areas stocked last week include Wyoming Pond and the Wood River in Arcadia Management Area from Rt. 165 downstream, as well as several fishing access areas along the Wood River including Barberville, KG Ranch Road, and Dow Athletic Field in Hope Valley. Silver Spring Lake in North Kingstown, Barber Pond in South Kingstown, Frosty Hollow Children’s Pond in Exeter, Olney Pond in Lincoln Woods State Park and Carbuncle Pond in Coventry were stocked last week too. This week DEM plans to stock Eight Rod Farm in Tiverton, Lower Melville Pond in Portsmouth, Meadowbrook Pond in Richmond and Carolina Trout Pond in Hopkinton. Striped bass bite remains strong along southern Rhode Island beaches and the West Wall or the Harbor of Refuge in Jerusalem. Craig Castro of Erickson’s Bait & Tackle in Warwick reports customers continue to take school striped bass on Greenwich Bay at Chepiwanoxet Point. Dave Henault of Ocean State Tackle in Providence reports customers taking school bass in the Providence, Seekonk and Narrow Rivers. Angler Eric Feroldi caught a 12 pound and a 16 pound striped bass in the Pawcatuck River midweek. Tautog fishing started to pick up as the weather warmed and fish moved closer to shore and up Narragansett Bay. Some good sized fish being taken. I took three fish this weekend; my largest was about 21 inches. This is the second week I fished Coddington Cove in Middletown, RI. Cod fishing has been good with the Francis Fleet out of Galilee, Rhode Island still making regular trips. Rhode Island and Massachusetts anglers report a continued good bite at Stellwagon. Fresh Water fishing for bass, pike and trout remained good. Particularly in trout stocked fishing areas. Visit http://www.dem.ri.gov/ for a complete list of stocked lakes, ponds and rivers. 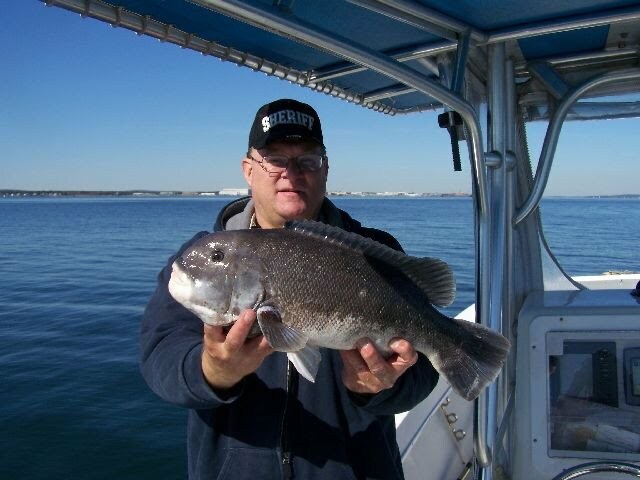 Captain Dave caught two tautog this Sunday at Coddington Cove in Middletown, RI. This 22’ fish took a green crab in about 15 feet of water right on top of the jetty. This was a busy week for saltwater fishing. Rhode Island’s fishing license law took effect Friday, April 16 along with new 2010 fishing regulations. A new volunteer electronic recreational saltwater fishing logbook was announced by the Department of Environmental Management (DEM) and Thursday, April 15 was the start of the tautog season. The license is available online at http://www.saltwater.ri.gov/ and will be sold at bait shops starting June 1. The cost is $7 per year for RI residents and $10 per year for non-residents. There is a temporary 7-day license available for $5. The license is free for anglers over 65 years of age and for active military personnel stationed in Rhode Island. No license is required for anglers under 16 years of age, for anglers fishing on licensed party and charter boats, for anglers who are on leave from active military duty, and for anglers who are blind or permanently disabled. The RI license enables the holder to fish in RI and federal waters as well as in all state marine waters throughout southern New England and other states that have reciprocal agreements. The license program is designed to improve the quality of marine recreation fishing data which will in turn help insure that recreational fishing regulations are fair and based on sound science. Data from RI and other states will be put into a national data base allowing the new Marine Recreational Information Program to survey current fishermen. Here is the part I like… all of Rhode Island’s saltwater license fees will be put in a restricted account and can only be used for marine recreational fishing such as program administration, to improve the management of Rhode Island’s marine recreational fisheries or to enhance recreational fishing access.. This law is good. 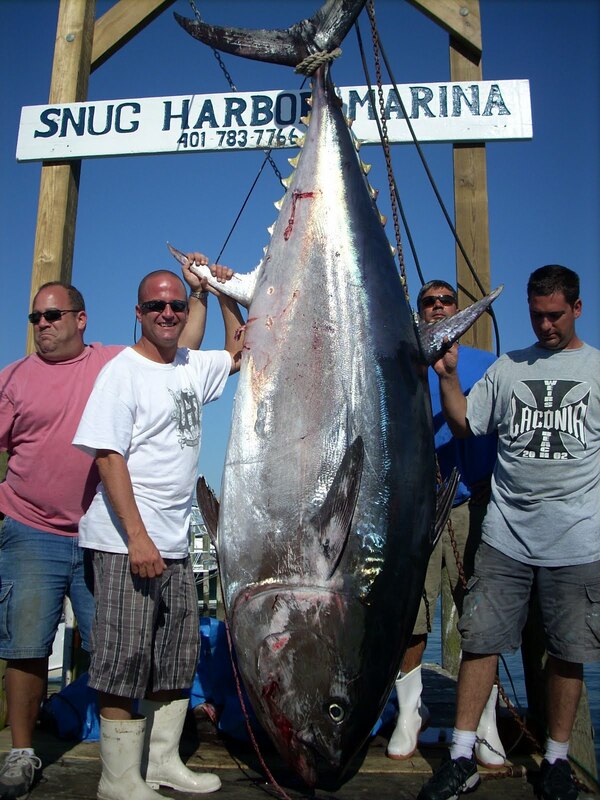 It was written by DEM in conjunction with the Rhode Island Saltwater Anglers Association. New 2010 saltwater fishing regulations have been announced by DEM The regulations govern fishing for summer flounder, black sea bass, scup, and weakfish (there are no changes for striped bass or tautog); commercial regulations were also announced. Visit http://www.dem.ri.gov/ for details, here are some highlights. 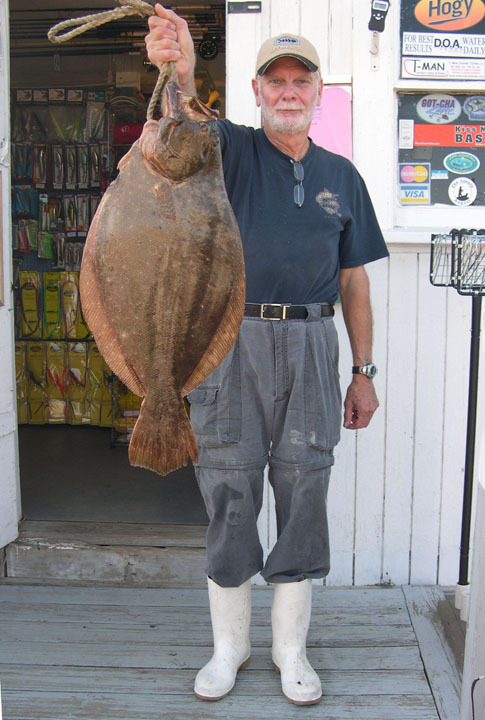 Summer flounder: The season opens on May 1 and runs through December 31. The minimum size is 19.5”, possession limit remains at 6 fish/person/day. Black sea bass: Season runs from May 22 through September 12. The minimum size is 12.5”, possession limit remains at 25 fish/person/day. Scup: The fishery has two modes. For the general mode (everyone except those fishing on party and charter boats), the season runs from May 24 to September 26. The minimum size remains at 10.5” with a 10 fish/person/day catch limit. For the party and charter boat mode the minimum size is 11”; the season runs from June 8 to September 6 with a 10 fish/person/day. The possession limit then increases to 40 fish/person/day from September 7 through October 11. Weakfish: The fishery remains open year-round, and the minimum size remains at 16”. However, the daily possession limit is t 1 fish/person/day). Striped bass: The regulations for 2010 are the same as last year: a year-round season, a 2 fish/person/day possession limit, and a 28” minimum size. Tautog: The regulations are the same as last year: 16” minimum size, the season opens on April 15 at a 3 fish/person/day possession limit, then closes for the month of June, and then reopens from July 1 through October 16 at 3 fish/person/day, increasing to 8 fish/person/day from October 17 through December 15. DEM’s Marine Fisheries Program and the Atlantic Coastal Cooperative Statistics Program has developed a volunteer electronic recreational saltwater fishing logbook. Information is presented in graphic and tabular format. Anglers will be able to see their catch history in real time. 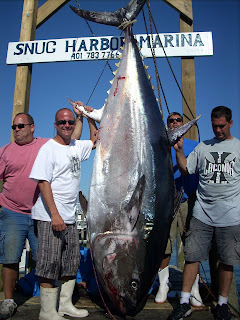 For more information and to sign up go to http://www.saltwater.ri.gov/ . Tautog season opened April 15. Several fish caught at Spindle Rock and Ohio Ledge said Ken Ferrara of Ray’s Bait and Tackle in Warwick. I stopped by to see Ken for the first time since he was out ill at the end of last season and he is doing well. Ken is an outstanding angler and bait and tackle shop owner. He has helped thousands of anglers with good advice including me. Nice to have you back Ken. I caught two tautog Sunday at Coddington Cove, Middletown (one was 22”). Dave Henault of Ocean State Tackle, Providence, reports a slow tautog bite in the Bay but off-shore fishing is good with thirty fish being taken off Westport. Dave said that turbulent water with a lot of particles is not good for tautog fishing. It keeps the fish off shore in deeper water. Striped bass season is underway. Steve McKenna of Cranston and an employee of Quaker Lane Outfitters reports an outstanding school bass bite at the West Wall in Narragansett. Most were caught in the late afternoon and just before dark. The fish were primarily caught on three and four inch pearl Cocohoe minnows and the new Bomber mud minnow in the four inch model. Both soft plastics were fitted on ½ lead head jigs for casting weight. Steve said, “There is a lot of bait in the area. More bait than I have ever seen in many a year.” This is encouraging, especially since Steve has been one of Rhode Island’s best shore striper fishermen for over 30 years. Craig Castro of Erickson’s bait & Tackle, Warwick, reports customers catching school bass off Chepiwanoxet Point, Warwick using soft plastic baits. Freshwater bite remains good. 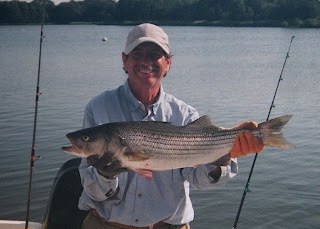 Craig Castro of Erickson’s Bait and Tackle reports a good trout bite at Carbuncle Pond and all ponds/lakes stocked by DEM… Lincoln Woods, Silver Spring Lake and others noted on DEM’s web site (http://www.dem.ri.gov/ ). Paul Eaton of Providence proudly holds up the trout that he and his friends caught thirty minutes after the 6:00 a.m. start of opening day. The fish were caught on Silver Spring Lake in North Kingstown. A carnival like atmosphere prevailed at Silver Spring Lake in North Kingstown this Saturday prior to opening day for trout season. There were tents, tables of food, grills and plenty of boats and anglers fishing on the lake. Thank you and congratulations to the Rhode Island Department of Environmental Management (DEM) and their Fish and Wildlife Division. They managed to pull off a very successful opening day for the freshwater trout season this past Saturday despite all the flooding. When I last spoke with Gail Mastrati, DEM communications officer, she was working hard to effectively communicate flood activities to the public… shellfish closures and openings, ground water contamination warnings, trout hatchery damage, flooding rivers with fast moving water… all needed to be addressed by DEM and communicated to the public for safety reasons. Early last week Mastrati related that DEM was moving forward with opening day on Saturday, April 10 with adjustments to allowable fishing areas and a revised trout stocking plan that put fish in lakes and ponds that have safe water levels and good access. Some lakes and ponds received extra trout for opening day including Barber Pond in South Kingstown and Sliver Spring Lake in North Kingstown. Several fishing areas that were not stocked due to high water and damage to roads and other access included Ashaway ,Pawtuxet, Pawcatuck, Flat and Falls Rivers and Parris Brook. These areas will be stocked later this spring when water recedes and access improves. Last week Steven Hall, chief of DEM’s Division of Law Enforcement said, “With all the recent rain we’ve had, Rhode Island’s rivers and streams remain at high levels, with quick water action,” Hall continued, “People should make an extra effort to take personal safety precautions… “. A carnival-like atmosphere was in play at Silver Spring Lake, North Kingstown, when I visited at 6:00 a.m. on opening day. Many anglers had spent the night lake-side to be able to fish at first morning light when the season opened at 6:00 a.m. There were tents, campers, tables of food with breakfast and barbecue grills. Everyone fishing had big smiles … the fish were biting. The fishing action was good at other stocked ponds and lakes too in Lincoln, Cranston and South and North Kingstown. Paul Eaton of Providence and his friends were very happy too. I met them at 6:30 a.m. and the trio had already bagged seven fish, after just 30 minutes of fishing. Paul said, “The fishing has been good, take a look at these.” He was holding up seven fish. At 5:00 a.m. on Saturday I visited a few bait and tackle shops. Neil Hayes of North Kingstown from Quaker Lane Outfitters said that business had been very good. Popular baits included meal worms, trout worms and Power Baits. Dan Ross of Warwick had been working all night at John’s Bait & Tackle in North Kingstown. Dan said that business had been very good and with warmer weather he and the staff predicted a good weekend and week. Craig Castro form Erickson’s Bait & Tackle said that twelve people had come in during the night but he expected things to pick up. Cod fishing is still mixed. Captain Charlie Donilon of the charter boat “Snappa” said cod fishing off Block Island on his boat has been mixed this past week. “The fish were on and off”, said Captain Donilon. The Francis Fleet is making Cod fishing trips at 5:00 a.m. Captain Steve Sheriff of Fish On Charters said that the Cod fish bite was good five miles off Block Island last week. Striped bass are here. Steve McKenna of Cranston said, “I caught the first fresh run of school bass of the year this week at the West Wall in Matunuck, RI. The fish were caught on Cocohoe Minnows on ½ oz. jig heads. The 2010 bass season has begun!! !” Other reports of bass being caught on the Pawcatuck and Narrow Rivers with some fish being pretty good size. While testing my new engine, I saw a good size bass feeding on the surface in front of the Old Buttonwoods section of Warwick. Dave Henault of Ocean State Tackle, Providence, reports school bass being caught in the Providence, Seekonk and Narrow Rivers. Tautog season is scheduled to start April 15 unless we hear otherwise form DEM. A limit of two fish per angler per day is expected for the spring season. Fresh water fishing. See above article. Also trout fishermen at the John L. Curran fishing area were besieged by horned pout as they drifted mealworms and caught 17 of them. The runoff and turbine water have the horned pout on a feeding frenzy said Dave Henault of Ocean State Tackle.